How insulting is that? Very. I ask George Rodrigue, an artist with a distinctive style and focused vision to suspend his own direction and copy someone else’s. Worse, I do this with proof of his disdain. Some twenty years ago a client and friend convinced him to paint a Remington, an eight foot canvas of cowboys and horses set in a dusty western Clint Eastwood background, a painting identifiable as a Rodrigue only by his signature on the back, and a source of such acute humiliation (from a man who rarely, if ever, feels embarrassment), that he refuses to allow me to reproduce the image here. 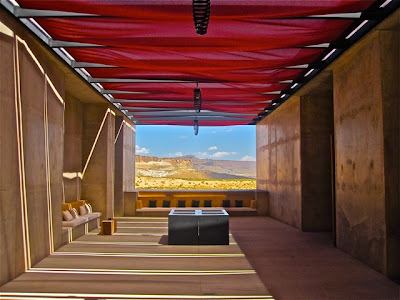 Not only am I lost in a Rothko, I’m relaxed, and the feeling rushes back each time I stand before an original painting, similar to if I somehow reproduced the view of this canyon country rock, its changing colors in the western light, and the jillion stars amassed above it, so that it appears outside my own picture window on any given day, and not just during this week’s vacation in southern Utah. In truth, there are paintings of George’s, all his own, that inspire similar feelings in me. 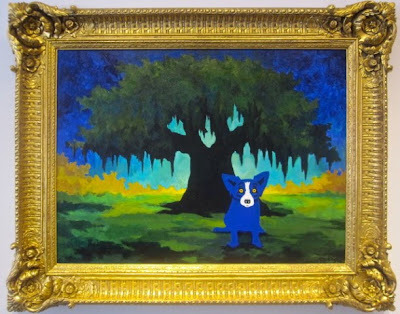 For example, recently he completed the large canvas Green is Green, Not Blue (2010, 36x48, acrylic on canvas), a stunning work painted to the frame, and blending the Rodrigue Oak and Blue Dog with an even stronger subject: light. The changes in tone lose me in a way similar to a Rothko, as the color shifts from dark to light and back again, as though the dog is pasted onto the landscape, and the tree is pasted onto a mood. In person, this painting is not just beautiful, it’s an escape, a jewel, reminding me of an earlier Rodrigue painting, my favorite, the one I’ve been lost in for years and write about here. 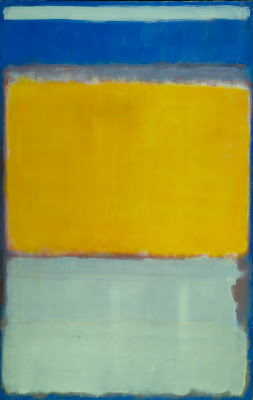 I find it interesting that in both Rothko and Rodrigue, the colors belie the result. 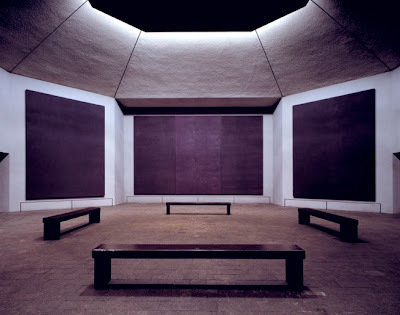 Neither artist paints with the pastels of relaxation nor the softness of a ‘pretty picture.’ To the contrary, they seek intensity on their canvases, in George’s case growing brighter and brighter, indeed frustrating him at times that his colors cannot reach the strong hues within his head; and in Rothko’s case growing darker and darker, as evidenced by the Rothko Chapel. And yet, over the years George has grown comfortable with acrylics, able to accomplish things with this paint he originally thought impossible (such as in Green is Green, Not Blue, above). Furthermore, his recent work in water-based oils achieves a certain quality reminiscent of those mesmerizing layers and textures, the necessary ingredient if one is to get lost in a painting, to forget the context, the walls, even the subject. But the Rothkos are serious and sometimes a bit too serious, while that little blue dog is funny! So the painting does not evoke any Rothko for me. Besides, the colours of the landscape behind the tree are luminous in themselves. Rothko's colours always look as if the source of light were behind the canvas, so that some of his paintings even look spooky, like something announcing an UFO for instance. 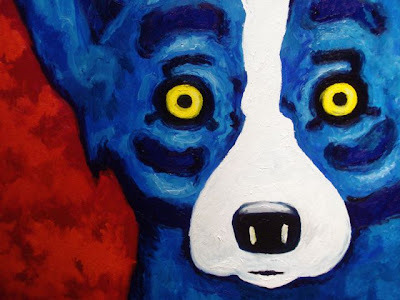 Hi Cantueso - Although some are rooted in humor, especially from the early 1990s, most of the Blue Dog paintings are quite serious, at least to my eye (and to George Rodrigue's, I might add), and they certainly evoke emotions. As far as the comparison with the painting "Green is Green, Not Blue," I did not mean to suggest a similarity between the two artists or their art, but rather in the depth of mood transferred to this viewer from the work. It is probably the most wonderful thing about art that we all see our own meaning and react in our own way to something personal and raw from another individual --- as though they've exposed something from inside themselves for all of us to judge. For me, a Rothko is not 'spooky,' for example; however, the next time I'm before an original painting, I'll remember your comment and give it some thought.